Posted on May 2, 2012 October 16, 2016 , in HIAB Crane. Herman Brood, the Dutch artist was invited by Cargotec in 2000 at the RAI exhibition, to paint a HIAB loader crane. 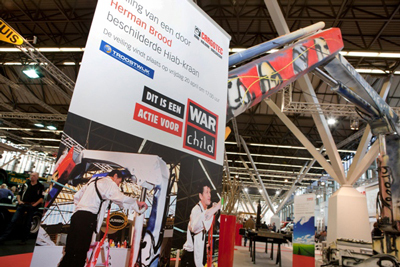 At the RAI exhibition that took place this year, on the 20th of April, the same HIAB 102 crane was auctioned to fund money for War Child, an independent charitable organization. Cargotec Netherlands’ Marketing Manager Paulo Cardoso stated that the HIAB 102 painted by Herman Brood was going back to Amsterdam – the same city in which it was created. He also shared his happiness by saying that they couldn’t have hoped for a location better than Amsterdam for the crane, and that a staggering figure of 11,750 Euros would be transferred to the humanitarian organization. One of the departments of Amsterdam, Afvalservice West stole the show with its bids, beating all others in the active auction at the RAI exhibition. Afvalservice West, a department in the city of Amsterdam, worked closely with the city’s department for culture and the goal is to feature the crane for display at Stedelijk Museum – the City museum of Amsterdam. The late Herman Brood, a multi-talented artist, musician and painter, was among the most popular residents of the city of Amsterdam. Lola Brood – his daughter, in attendance at the auction, stated that her father’s long-time wish to have his work displayed in Amsterdam’s masterly museums is now a reality. Paulo Cardoso said that their goal of having a positive influence on community and humanity has been met. He assured that the public will be able to enjoy a fine piece of art, and that the money will be put to good use by War Child. He also took time to thank Troostwijk Auctions for their efforts in contributing to help achieve the outcome.